68 years ago today was one of the most significant days in America's history - D-Day. But 79 years ago today, the first drive in movie theatre opened. 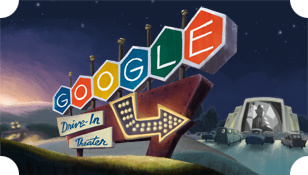 Google picked, as it always does, the fun and light hearted even to celebrate with a special Google logo, aka Doodle. So get past the fact Google doesn't have a logo for D-Day. There is still the concern for some that Google does logos at all on days like today. That is not for me to decide, just to report based on complaints in the forums. Make sure to notice a bunch of the Google items like Android toy in the car and other items. The first drive in theater was opened in New Jersey on Admiral Wilson Boulevard at the Airport Circle in Pennsauken with 400 car slots operated by R.M. Hollingshead Corporation.